The march is set to end on February 27 at the state Legislative Assembly in Mumbai, when the Budget Session would be in progress. Tribals, landless agriculturalists and small farmers converged in Nashik on Wednesday for their second “long march” to Mumbai since March last year. In small contingents, they arrived from places like Peint, Trimbakeshwar, Kalwan, Palghar and adjoining areas, getting off their dust-covered vehicles 8 to 15 km outside Nashik to reach the starting point at the inter-city Mahamarg bus stand. Police estimated that around 7,500 farmers have reached Nashik. The vehicles were loaded with provisions such as rice, flour, oil and salt in anticipation of the seven-day march that was to begin on Wednesday. However, the All India Kisan Sabha (AIKS) said the farmers would set off on Thursday, as contingents from Thane and Palghar districts, who were delayed after being stopped by police, were expected to reach by then. The march is set to end on February 27 at the state Legislative Assembly in Mumbai, when the Budget Session would be in progress. The one-day postponement has given the state government a chance to talk to the agitating farmers and reach a settlement. Deputed for the purpose, Water Resources Minister and Guardian Minister of Nashik district, Girish Mahajan, arrived in the city on Wednesday. On Tuesday, the Nashik police had refused permission for the march. The police, however, had said while they would not allow a procession, the farmers could hold a protest in Nashik. He asked the congregation to sleep over at the Mahamarg bus stand, where the police has corralled all the protesters. After Gavit’s announcement, the area wore a festive look as participants started cooking their evening meal to the sound of folk songs. “AIKS has never been against talks. We are ready for discussions and have initiated it a number of times. However, we have seen how the government has betrayed us and been negligent to our needs. We are open for discussions but that does not mean that we will call off the march. Both will happen simultaneously,” AIKS state general secretary Dr Ajt Nawle said. The government, meanwhile, said that it wants the protesters to call off the march and it was ready to address their concerns. “All issues can be solved by discussion. Last week, when we met at Mumbai, all these issues were discussed threadbare. We believe that we have fulfilled most of the demands. However, if anything is pending, we can sit and find a solution. I plan to meet them and we hope to find a resolution. The government is sensitive and we do not see why the farmers would have to walk for 200 km for a solution that can be found here,” said Mahajan. AIKS is seeking a complete loan waiver for farmers, implementation of Swaminathan Commission recommendations and Rs 40,000 per acre relief for all drought-affected farmers. Its charter of 15 demands included MSP at one-and-a-half times the full cost of production, a pro-farmer crop insurance scheme, increased pension as well as ration and food security. It has also demanded that the government should give land belonging to various temples in Maharashtra to the farmers for plowing. It wants the government to block all the water from rivers that runs into the ocean and divert it for farmers’ needs. It has also demanded that this water should be used for Maharashtra and not diverted to Gujarat. Further, it has sought expedition in the process of providing land titles to landless farmers under the Forest Rights Act (FRA). 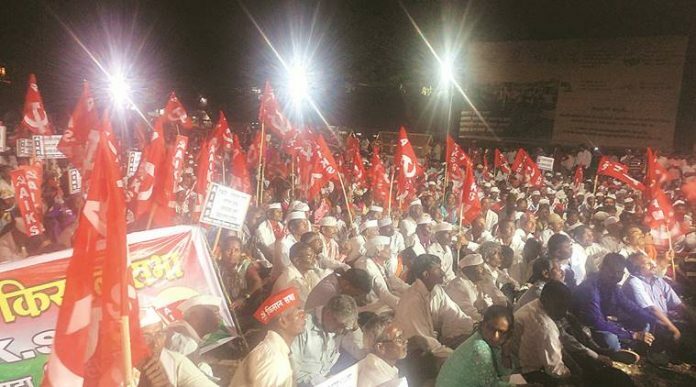 In March last year, around 40,000 farmers had undertaken a march towards Mumbai to stage a protest outside the state Legislature against the government’s response to the distress in the farm sector. The “long march” had been called by Akhil Bharatiya Kisan Sabha, which is affiliated to the CPI(M). The protesting farmers were subsequently given an assurance in writing by the state government that their demands, including clearing pending appeals in connection to applications for titles to forest land, would be accepted. Many of the participants are farmers who took part in the first long march. “I had walked last year all the way to Mumbai. I was ill throughout the journey and walking for this long does take a toll on your body. I have decided to participate in this protest because if I do not do this now, my future generations will have to live like me,” said Ganpat Damu Kunwar, a landless farmer from Nashik district. Kunwar cultivates an acre of land in Ravalgaon village, which he does not own. He has pinned his hope on the effective implementation of the FRA, which could provide him with a land title. Many of the participating farmers complained that inspite of the government’s assurances after last year’s march, nothing has changed. “The government had assured that our demands would be met. However, it seems that it has not passed on these orders down to the bureaucracy, which continues to be indifferent towards us,” said Chabu Gavit, a resident of Surgana.